My time in the last three months has been spent appreciating life in Australia, sharing time with family and friends, building strength (mentally and physically), and taking a few road-trips with Adrian. I try to look for beauty wherever I am, and I usually find it! Being surrounded by beauty, relaxes me and makes me breathe easier…..even when I am climbing steps in a rain forest! Here are a few snapshots from a recent trip to the Blue Mountains in New South Wales. Road-trips! I love taking them with my husband, especially when our destinations include meet-ups with friends and family. A few weeks ago our road-trip allowed us to visit our friend, Terry Hennessy, in Kangaroo Valley, NSW. We enjoyed hearing Terry’s stories, seeing the unusual puppets and musical instruments that he has built, and sharing meals together. Luckily, Adrian and I don’t have to go all the way to Kangaroo Valley to see kangaroos! I photographed this mob during a 10 minute drive from my home in Daylesford, Victoria. The beauty of these funny animals never grows old. I often wear a kangaroo necklace which Adrian gave me about 10 years ago. Kangaroos symbolise moving forward in life, as they cannot jump backward. Isn’t that beautiful! I happily wear my kangaroo and enjoy moving forward in life with Adrian. Speaking of beauty….the views from my passenger seat during road-trips in Australia provide an abundance of it! Beauty inspires me, and I like to be inspired. Speaking of inspiration…..I’m always inspired and energised by visits with good friends. Adrian and I recently reconnected in real-life with our friends, Pip Cowan and Graeme Padgett, at the Murray River Horse Trails. We spent a lovely afternoon watching the horses, patting dogs, making new friends, and playing music that made hearts dance. That’s a successful road-trip event and an afternoon well spent, if you ask me! Adrian and I took a trip to Numurkah, Victoria, Australia, to visit our friend, Pip Cowan. 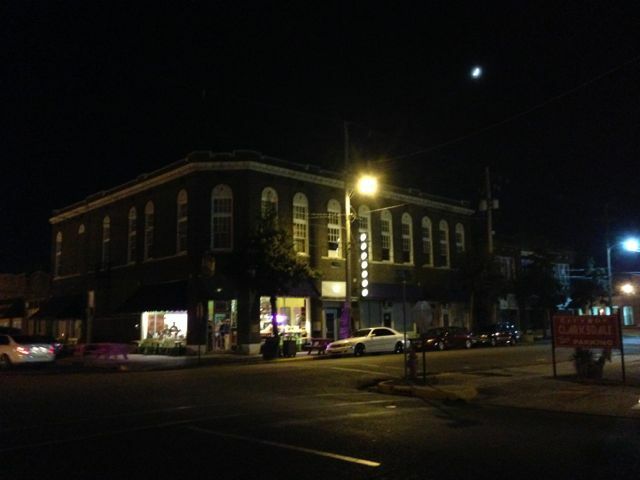 Pip has been to Clarksdale, Mississippi, USA, recently. By just a few days, we missed seeing each other in America and had to catch up in Numurkah. 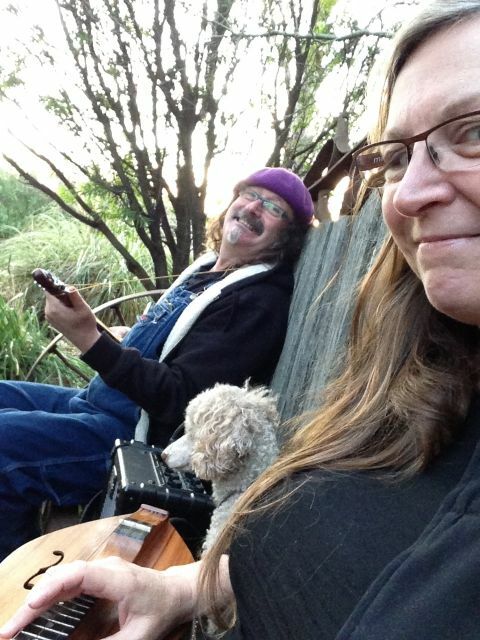 Pip has an interesting story to tell about his travel to the Mississippi Delta in his wordpress blog: Busking My Way to Mississippi. It was a pleasure to visit with Pip! While Adrian and I were visiting Pip, we met one of his good friends, Graeme Padgett. Graeme runs a horse trail riding business near Numurkah. Pip and Graeme are two of my new, very fascinating, Aussie friends! Another wonderful road trip took us to visit Adrian’s long-time friends in Port Fairy, Victoria: Brian and Claire Atkins, a beautiful couple of artists! It was a 20+ year reunion for Adrian, while I enjoyed getting to know these lovely, talented, interesting, people. Claire is a glass artist, and Brian is a retired boat builder (his grandson, Nick, has taken up the business). They are both fantastic story-tellers, too! It was a pleasure to get to know Brian and Claire. What a beautiful place Port Fairy is! There are a lot of things I can do in this world, but one of the most valuable things is spending time with friends and family. I always feel blessed when time is spent this way. My few summer months in Daylesford, Victoria, Australia, passed by quickly (too quickly), as I enjoyed life there with my husband, Adrian, and Miss Jelly Bean. We had lots of lovely visits with family & friends and a few wonderful road trips. A three-to-four month timeframe doesn’t seem like enough time to be in some places, sometimes, but at other times, that’s plenty of time to do something good and move forward. I’m here in America now, with Adrian, in Clarksdale, Mississippi, having my second summer of this year. Already, it’s very hot, although this Mississippi Delta summer has just begun. Adrian and I have been enjoying a visit from our Australian friend and bandmate, Phil McNamara. Phil is The Holy Moly’s first guest Artist-in-Residence! We’re happy to have Phil’s help in setting up a system for future artists in residence at The Holy Moly. Our friend from Portland, Victoria, Australia, is also coming and going, visiting us in Clarksdale, and sharing her amazing enthusiasm for life and travel, not to mention her knowledge of knitting! I’ve been her obedient student, knitting my days away for months, and loving it. Currently, I’m waiting for Jacqui to return to help me finish up Adrian’s V-neck vest which is in progress but was put on hold the minute I actually began to knit the V in the v-neck vest. Meanwhile, craft bear work is my specialty! I’ve been knitting up little cuties — I’m enjoying my new love of craft bear (as opposed to craft beer, get it? hahahaha) — and having a lot of fun with photographing them. Adrian and I recently played for the breakfast crowd at the Bluesberry Cafe in Clarksdale. There’s music there every weekend morning, just around the corner from our house! As far as family life goes, I’m loving being on this continent, closer to my all American daughter and other family members. We have had several really good visits, recently, and I am thankful for that! Our family’s big news is that Alex is getting married! Her fiancé, Kevin, is a fabulous addition to our family. We’re having fun with the excitement that goes along with planning a marriage. Adrian and I are working on the latest ideas in The Holy Moly project and moving forward, slowly, but surely, always in the pursuit of happiness and our next Waffle House experience. Blues music brought me to Clarksdale for a visit in 2006. At the time, I never imagined I would return to Clarksdale to own and live in an old masonic temple building in Clarksdale’s historic downtown blues precinct; but, here I am, doing just that! In 2012, my husband and I needed a project, and it looked like Clarksdale needed us. In 2012 my husband and I purchased a building to help revitalise Clarksdale and to give us something to do while we were in the U.S.A. My husband had experience with this sort of thing (revitalising buildings), although it had been 10 years since he had refurbished any buildings. It didn’t take too long to set-up our living area inside the old masonic temple building, but it has taken almost three years (including many months away, returning several times to Australia for various reasons) for us to “complete” the revitalisation of this building. By “complete,” I mean that we are now feeling happy about the way the building looks and about having tenants (and a functioning cafe) inside the building! 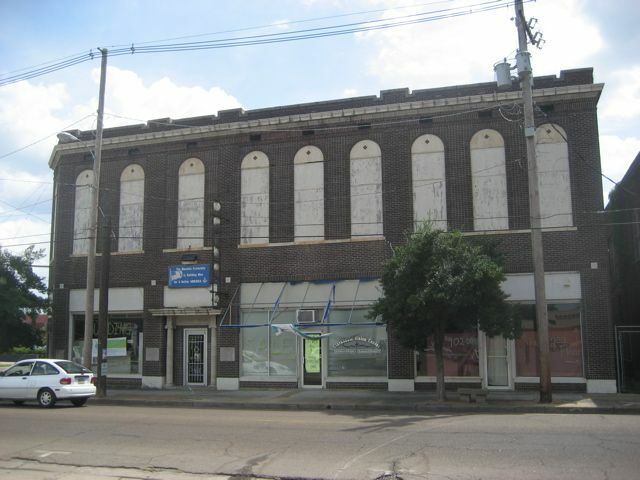 We did not revitalize this building by ourselves. It has taken a whole team of good community-minded people wanting to see The Holy Moly project succeed. Right now, I’m not wanting to write a description of the renovation project. This is not the right blog for describing the project in detail. What I do want to do is share a few videos I made recently, whilst working in the cafe in the corner of The Holy Moly. I’m also wanting to describe what I hope to see continue in Clarksdale – at The Holy Moly! Here’s a little sample of the music, people, and fun that has come to one small section of The Holy Moly. I made this video in October 2015, on my last night working at The Holy Moly Drug Store, although I did not know it would be my last night. My husband and I had recently sold the restaurant business and leased the space to a couple from Australia. The new tenants/owners of The Holy Moly Drug Store decided not to reopen the shop the next week. The musician playing in the video above is Terry “Harmonica” Bean. There have been a number of successful events/tests in The Holy Moly. Now that the testing phase is over, hopefully, Adrian and I can move forward with a bigger calendar of events for the theatre and dining room on the second floor. I’m dreaming of house concerts, workshops, mini-festivals, and more. We’re going back to Australia with our thinking caps on, and we hope to return to Clarksdale in March 2016 with renewed enthusiasm. Blues is just one of the musical genres to be featured in the future of The Holy Moly project. It will definitely be included as a genre, but not as my way of life. I am in the pursuit of happiness in this Americana Music Triangle in which I have made my American home!